I noticed a tweet to the FDA the other day, asking them to make sure pet products are safe before they’re sold in stores. Someone’s puppy had died. I wondered if the petitioner discovered there are no regulations requiring pet products be tested for safety before going to market. According to the Center for Pet Safety this includes toys, even safety equipment like life jackets (and it is reported that one was built so poorly, test results are said to indicate it assists your dog in drowning) safety harnesses, carriers, crates, pet car seats and more. What’s a pet parent supposed to do? Of course, you would rightly think most manufacturers want to produce a good, popular product that everyone wants to buy. They make a profit, grow their company, some maybe fund their charitable interests…but counting on self-regulation is a real danger in any industry. Due diligence is important and independent testing provides the best avenue for transparency. Public trust is not something a company wants to lose, and that’s what happens when there’s a massive product failure. We’ve seen it before in pet food, treat, and chew products. I hope brands are lining up to get the Logo Seal of Approval bragging rights available to those who fully comply with standards, though according to test results, many have their work cut out for them. Pet parents want companies to build pet safety into all their brands. 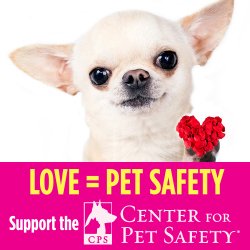 The Center for Pet Safety helps industry help itself and our pets. Standards for pet product safety are at last being formulated through independent science-based testing. Bark Out Loud! You may remember the stunning videos from this organization in 2013, when the safety harness study was released. It was a real shocker to find so many harnesses claiming crashworthiness failed catastrophically. Unfortunately, this year’s results show once again show the necessity for this third party testing process. Listen in to this informative interview with Lindsey Wolko, Founder, Chairman, and CEO of the Center for Pet Safety, as she talks about the 2015 results for pet carriers, the expert testing organization they use, what to look for in advertising spin, what’s up next for CPS, and how you can get involved. I hope you’ve avoided crashing with a non-crashworthy pet safety restraint, but if not and you’d like to share, we’re all ears. What was your first experience with an unsafe pet product? I am the owner of an online pet supply business, I sell products for three companies who now manufacture their pet products in human grade facilities, make their beds from recycled plastic bottles and have started to test their products for pet safety. I am sure more will follow to compete with their rivals. This is great for all us animal lovers. I had no idea that companies were not required to test products for safety for our fur children. Glad to hear the pet industry is beginning to work on this. What I find interesting is that in recent years as "pet parents" have really come out of the woodwork, we're now seeing so many advances in animal safety, just as there are for human safety. For someone like me who calls my animals my "kids," safety is everything. @DogMomDays I am as happy with the advent of science-based independent testing with Center for Pet Safety as I am with the advances in pet health care to better reflect what we do for ourselves in these areas. Safety is everything when it comes to our pets, so glad the pet industry is testing these products. 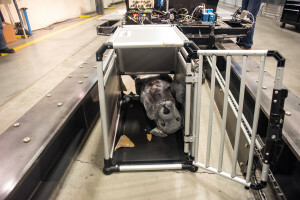 I'm glad that the pet industry is taking pet safety seriously enough to crash test carriers these days. These tests reveal a lot of interesting information about the carriers on the market. It is so important not to buy something just because it is cute. We really have to be careful when buying products for our pets. It's sad that there no regulations on these products. @OlfaTurki So true, Olfa! You would think safety testing of pet products would be a no-brainer. You'd think that before selling anything, it should be tested for safety; within reason, of course. 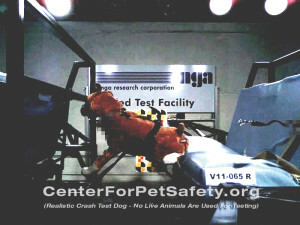 The saddest thing were the dog car safety harnesses which when tested caused more harm than good. @DawgBlogger Consumers would think that pet safety would be built in to pet products, and of course that's an advantage to manufacturers they are aware of. Then there are makers who believe in their brand and the testing done to be without error. I'm certain it came as a surprise to find their product was not safe. It is heartbreaking to think of all the dogs who were killed or injured for life because a safety harness failed -- and now the same for pet carriers. So scary. A trainer I know lost a puppy in a car crash- the crates did not resist. Thanks for sharing. I am looking at harnesses for Kilo the Pug now. @dk9n Thanks for the mention! Just tried leaving a comment, but not sure if it worked. If this ends up as a duplicate, feel free to delete! I would love to eventually get Ginger a seat belt harness, but feel like I need to do quite a bit of research first to make sure I get the best one for her and one that will be safe. For now, she usually gets to ride in a crate that is secured in the back seat. I wish there was more testing for pet products and better regulations! I'm happy (limited) testing exists and I hope it improves. Mr. N has a Sleepypod that I bought for air travel but also because it passed the car testing process. It's pretty scary that there are no regulations on pet products. We have to be even more careful when choosing products for our pets. I think its important to show our support of companies that do uphold high safety standards by showing our approval with our voices and with our money! I wish there were regulations on pet products. 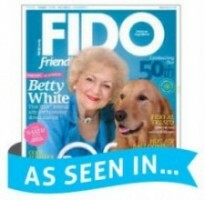 With my blog reviewing products I hope to help pet parents find the right products for their pet! @TheChesnutMutts Yes, it's dicey to recommend equipment meant to save lives or other products that aren't safe at all. I was glad to hear many of the manufacturers are working hard to comply. Many, but not all. I think significant and across the board change will happen only by raising our voices, voting with our dollars, and keeping tabs on progress in this area. How truly horrible that there are no regulations requiring pet products be tested for safety before going to market. This needs to change and I can't thank you enough for bringing light to this. @JenniferSh Having third party, science-based testing for pet product safety really is a matter of life and death. I'm so happy there is an organization that offers this to brands, reducing a company's cost and keeping results accurate. It's wonderful to see the service to animals evolving in a way that gives them the safest products, and affords the opportunity to brands to gain stature and loyalty from the pet-loving community. And how about that Subaru! They've sponsored both these tests. CPS needs more sponsors like that! Of course, all the pet community can help, even in small amounts, foregoing that Starbuck's for a day! Next post: Beagle Freedom Project: Research Animals Win! !